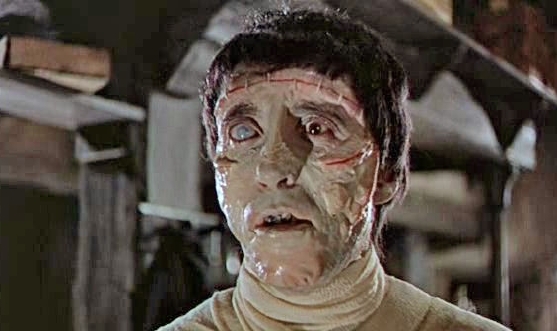 2007 is the 50th Anniversary year of the release, on May 2, of The Curse of Frankenstein, the film that put Hammer Films of England on the map and rebooted the Frankenstein movie saga. Christopher Lee played a gangling, spastic Creature, as if every part of him had a mind of its own. The makeup was a mess, but it worked. I saw the film in a second-run house in 1960. When the camera rolled up and Lee ripped the bandages from his face, everyone in the theater jumped a foot out of their seats, the combined effect of the sudden sight of Lee’s leering mashed-potato face and an entire row of teenage girls SHRIEKING on cue. The rest of the movie was watched from one’s seat edge, everyone in the house pumping adrenaline until the final scene unspooled. It was one of those unique, memorable, communal film experiences. I never experienced anything like it again, with the sole exception of Alien, in 1979, which had everyone in a packed theater on opening night crawling out of their skins. By the end of 1957, with The Curse of Frankenstein a stunning, worldwide box-office hit, Christopher Lee, his friend Peter Cushing, and director Terence Fisher reunited at Bray Studios on November 11 and began work on Dracula (aka The Horror of Dracula). 50 years on, Christopher Lee is still busy, and we’re all grateful for it. We’ll see him next in The Golden Compass, come December. But Lee's "Creature" has grown on me. With the script he was handed, I think he did an excellant job. Great post! I love Chris Lee's version of The Monster too. I love that Bruce Timm poster. I love his work! I've long appreciated Lee's work in CURSE, and even wrote a glowing retrospective of it (as well as Kiwi Kingston's in EVIL) for an issue of MIDNIGHT MARQUEE some years ago. It's good to know I'm not the only one who sees the performance's value! Craig: I understand your preference, but I never could compare the Universal and Hammer Frankensteins. Different times, different cultures, different approaches. Regarding “Mary’s Monster”: I was asked recently which Monster portrayals I prefer. Perhaps I’ll post my own personal preferences at some point, but I’d like to find a way to open it up (besides the comment box) for you guys to post your choices. I’ll think of something. David: I remember your article. Chris Lee’s performance was very interesting. It was new, different and perfectly valid. I do have a problem with Kiwi Kingston, though I think Evil of Frankenstein is much better than most people say. Christopher Lee is unmatched in his role as a Dracula. And I dare to state that he is better than Bela Lugosi. I like Lee, indeed, I do not like his today's roles, how in star War Episode II and III so much. In Lord of the Rings he was still tolerable. But I find the old films of Lee just brilliant! A man him knows what is an acting! It is pity Sir Christopher lee and Peter Cushing didn't do a biography film of themselves from childhood to when they died.